This is a pure anime classic. Honestly, I have no idea what took me so long to actually look this one up and watch it. It has a brilliant mix of action, heartfelt scenes, tear jerking deaths, and extremely lovable characters. With only 4 regular cast members (one of which doesn’t even start appearing until episode 11, and then takes another few episode hiatus), the rest are introduced and gone within 1-2 episodes, including the villains. They don’t necessarily die, they just aren’t shown or involved in the story line anymore. 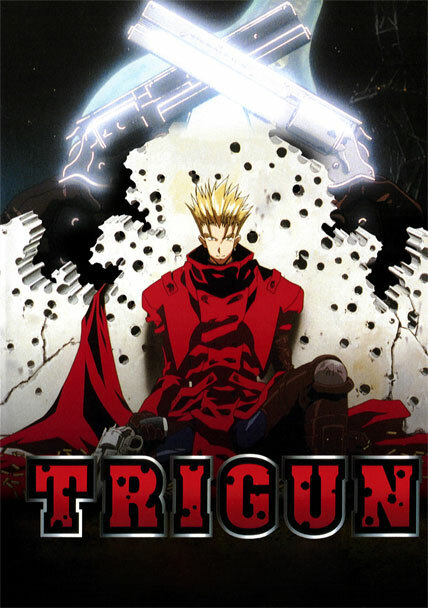 Trigun is about Vash the Stampede, an ace gun man with a vow to never take the life of another person, however evil he or she might be. In most cases, he comes across as a total carefree, klutzy dimwit. But, when someone’s life is on the line or he has certain things to come to grips with, he completely changes face. Vash is called the human typhoon, because he’s known as the man who completely obliterated the city named July and leaves destruction in his wake whenever he appears. Though he has no memory of July, he knows he’s responsible. He spends most of the anime hunting down the main antagonist, Knives, and his lackeys, Legato and the Gung-Ho-Guns. Knives has made it his personal ambition to wipe humans off the face of… whatever planet they’re on. The anime also follows two insurance representatives, Meryl and Milly, who’ve been given the task of tracking down Vash and making sure his resultant damage is minimal. Meryl is a logical thinker and a diligent go-getter. Milly is the quint-essential air head, but underneath she’s extremely intelligent. The pair make a remarkable counter cast to Vash and Nicholas D. Wolfwood. Wolfwood is by far my favorite characters in the series. He’s a priest and orphanage owner with a mysterious back story and an awesome gun. He wields a cross that’s taller than he is and extremely heavy. The triggers are in the center, the bottom is something of a machine gun, the top is a rocket launcher, and the cross bar can be unfolded, containing a rack of several hand guns. Unlike Vash, he’s okay with killing under a certain moral code. The chemistry (not romantic!) between Vash and Wolfwood is insane! In a good way. They are both extraordinary gun men with a will to protect the innocent. In episode 10, Wolfwood and Vash sign each other up for a shoot out contest, and I laughed so hard I could have died. Their differences in moral code make for some seriously heated scenes, but eventually they both change each other. If you become a Wolfwood fan, tissues are necessary for episode 24, which reveals his past and his changes. In general though, depending on how much you connect yourself with the main characters, you may need those tissues from episodes 15 and on. That’s when the main plot of the story reveals itself and the characters are really put through their paces. If you don’t love Vash after the humiliating and crazy things he does to protect even the most evil of human life, then you have no soul. Some of you might be okay with that, and if that’s true, well, then, alright. But for everyone else, Vash is the glue that binds all of the awesomeness of Trigun together, making a series worth watching.